Songdo (South Korea) (AFP) – The UN’s new Green Climate Fund (GCF) opened its headquarters in South Korea on Wednesday, facing the key challenge of funding its mission to support low carbon projects around the world. The GCF was essentially created as a mechanism for transferring funds from developed to developing nations to help them counter the effects of climate change. But aside from start-up capital, its coffers are currently pretty bare and the importance of filling them as soon as possible was underlined at Wednesday’s ceremony in Songdo, around 40 kilometres west of the South Korean capital Seoul. “The imperative is now to bring the funding to operation as soon as possible,” UN Secretary General Ban Ki-Moon said in a video address to the event, which was attended by World Bank chief Jim Yong Kim. IMF head Christine Lagarde missed the ceremony when fog prevented her plane from landing. The fund’s first executive director, Hela Cheikhrouhou, acknowledged the “monumental task” that lay ahead. “Now is the time to act to provide… leadership and the funding to keep climate change at bay,” she said in a speech. In 2009, developed countries committed to raising $100 billion a year by 2020 to help poorer countries with global warming, but current funding levels are way below that. “I hope the funds will soon be able to deliver capital to reduce emissions… empower local farmers, and support governments and businesses to adopt low emissions and climate-resilient options,” Ban said. The question of who should bear the greatest financial burden of the fight against climate change has long been a source of friction. Major developing nations including China and India, whose growth is largely powered by fossil fuel combustion, insist that the onus lies with wealthier nations with a far longer emissions history. Developed nations however insists emerging economies must do their fair share. The 2013 UN Climate Change Conference held in Warsaw last month saw 195 nations, after fraught debate for days, agree on a document urging developed countries to deliver “increasing levels” of finance for climate aid to poor and vulnerable countries up to 2020. The document also called for a “very significant scale” of initial funding for the GCF. Christiana Figueres, the head of the United Nations Framework Convention on Climate Change (UNFCCC), argued that it was premature to worry about the funding situation. “The question is a little bit like asking why nobody is living in a house that is still under construction. 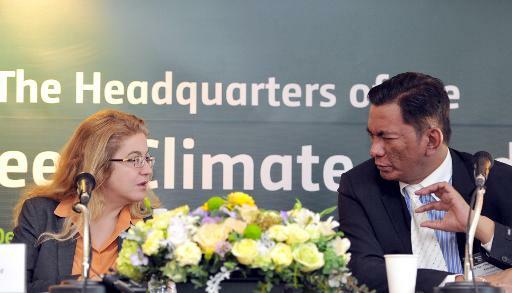 The GCF is still under construction,” she told AFP. “Once all of that is built and decided, then the GCF will open for capitalisation and we expect it to happen in the second half of next year,” she said.